PTCL has introduced a new Smart Pack package which is a bundled offer of 256Kbps Broadband data rate with Smart TV in addition to its existing Broadband data rate packages. Introduction of Smart Pack is an effort to aware people to opt for Smart TV at a lower price & with broadband data rate as low as 256kbps. 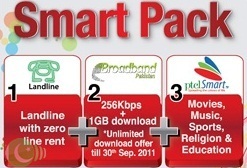 The new package is offered to the customers at Rs.749 / month with unlimited download. Access to free movies, music, classical Pakistani plays, famous cricket matches, educational and religious contents exclusively for PTCL broadband customers on ‘Buzz’ broadband web infotainment portal.